He used the "C" word. "Is Cleantech a dirty word?" I was asked this question over lunch today -- it's something that comes up regularly, like some disagreeable food. Just a few months ago, when we began planning for our 5th annual Mid-Atlantic Cleantech Investment Forum, my friends and co-hosts at BlankRome's Venture Group announced that we were changing the name of the event to Mid-Atlantic Energy Technology Investment Forum. They even asked whether we were changing the name of our group, Cleantech Alliance Mid-Atlantic. My co-founder hedged and said we'd discuss it later. Adam Lesser, writing over at Giga.om last month, asked, "Does the 'cleantech sector' need a new name?" "'Cleantech' is a dirty word right now in venture investing circles," Lesser posits. "And for me has never defined a sector as much as an idea—that we should leverage technology for the betterment of the earth." Over the past few years, we've had "clean energy" and "advanced energy"; once the favored term was "renewable energy" and even "alternative energy." And then there was the battle over "cleantech" or "greentech." And now there's even something called "cleanweb." A year ago, Lesser's colleague at GigaOm, Katie Fehrenbacher asked whether it was time to bury the term. The question remains whether this is just a down cycle for cleantech. 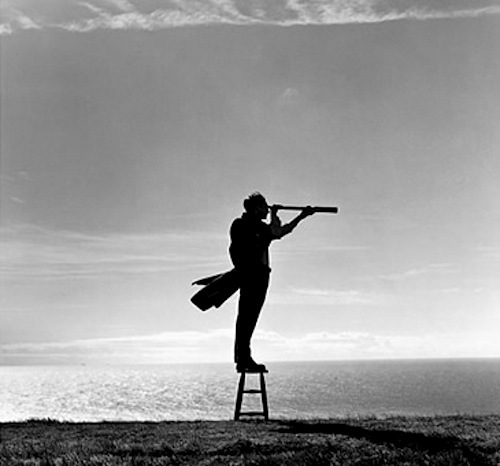 Is the sky falling for cleantech, as I asked in a post last summer? Or are we, as an investor friend of mine suggested six months ago, simply in Gartner's trough of disillusionment, shortly to be ascending the slope of enlightenment? For now, I'm sticking with the "C" word. 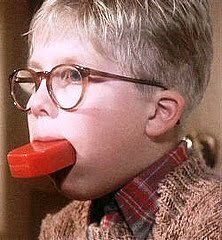 Get out the Lifebuoy! Are you an investor looking for opportunities to invest in the energy technology revolution? Are you an entrepreneur with a killer app or energy platform that's looking for funding? Are you a service provider wanting to learn about the latest trends in energy tech investing from venture to corporate and seed to late-stage? If you answered yes to any of these questions, you won't want to miss our 5th Annual Mid-Atlantic Energy Technology Investment Forum (formerly known as the Mid-Atlantic Cleantech Investment Forum). This is the premiere energy technology investment forum in the region and always sells out fast. So register today! Ticket prices include all processing fees. Hosted by Blank Rome's Venture Group, along with my Cleantech Alliance Mid-Atlantic, and the Academy of Natural Sciences, the 5th Annual Mid-Atlantic Energy Technology Forum will feature a panel of experts and thought leaders discussing energy technology venture and corporate investing (moderated by yours truly), as well as a showcase of leading Mid-Atlantic energy technology companies. Topics and presenters to be announced. Energy Technology Companies: We are currently accepting applications for companies who wish to participate in the Energy Technology Forum Company Showcase. Click here to download the PDF application. Forward completed applications by March 1 to Nikki Benner at Benner@BlankRome.com. Want to sponsor the Mid-Atlantic Energy Technology Forum? We are currently seeking providers of capital, technology entrepreneurs, and policy makers to participate in this forum as sponsors. Please contact Nikki Benner at Benner@BlankRome.com for more information. You don't want to miss this very popular event -- register today! As some 35,000 opponents to the Keystone Pipeline gathered in front of the White House yesterday trying to persuade President Obama to just say no to the pipeline, I reflected upon some of the myths about the pipeline that have been bandied about by both sides on the issue. 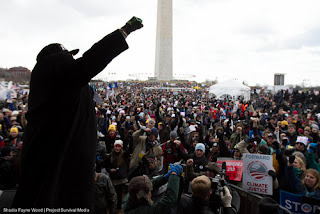 Keystone XL protest in Washington. There are, as in most things, no absolutes in this debate. Digging deeper than the rhetoric and sloganeering, we find that both sides exaggerate the impacts of the Keystone Pipeline, the positives and the negatives. 1.) Stopping KXL will help stop climate change - With the potential to transport an estimated 590,000 barrels a day, KXL certainly has a large carbon footprint. Yet, it is really only a drop in the barrel of global contributions to greenhouse gases. And if KXL is stopped, there is no guarantee there won't be alternatives to getting this oil to market; in fact, there are at least two proposed alternatives through western Canada being considered. 3.) Tar sands oil is not worse for climate change - Proponents of KXL claim that tar sands oil only produce 6 percent more carbon than conventional crude oil, but other reports estimate the amount to be more than 20 percent. Whatever the amount, there is certainly going to be an increase, which could lead to health risks from emissions and potentially increase the costs associated with increased climate instability. 4.) America needs the tar sands oil - The oil from KXL was never intended for US markets. It will make its way to the Gulf Coast refineries, where it will likely be put on the more lucrative global market. TransCanada stated as much in a presentation to investors, suggesting greater profits for the company. Besides, with greater fuel efficiency standards, our need for oil may in fact be decreasing not increasing. 5.) The US should buy oil from a friendly neighbor like Canada rather than hostile countries - The US has steadily been reducing its dependence on oil from the Persian Gulf for years. In fact, according to data from the Energy Information Administration, Canada and Latin America already supply more oil than Saudi Arabia and other countries in the Middle East. 6.) Tar sands oil will lower gas prices in the US - According to several studies, KXL oil will have little or no impact on overall US gas prices, which are set by a much more complicated set of global market factors. 7.) Tar sands oil will increase gas prices in the US - Again, KXL oil will have little or no impact on gas prices across the US, although according to a recent study, it could increase prices in the US Midwest by 10-20 cents per gallon, as the oil bypasses that market and heads south. 8.) Oil leaks from the existing pipeline have little impact on the environment - Proponents of the pipeline like to downplay the environmental impacts of oil leaks. However, the existing Keystone pipeline, to which the one under debate would be an extension leaked at least 12 times in 2011, including one spill in North Dakota that amounted to 21,000 gallons of oil, and a different tar sands pipeline spilled over 840,000 gallons of crude oil into the Kalamazoo River in Michigan in 2010. Such spills have an economic impact as well. The costs of the Kalamazoo River cleanup exceeded $650 million. 9.) Tar sands oil will reduce US dependency on foreign oil - It depends upon how you define "foreign oil." Arguably, Canada is still not a part of the US and, even if some of this oil were to make it into the US market, in the scheme of things, it matters little where oil comes from in what is a complex, interdependent global market. And, if the tar sands oil will be refined in Port Arthur, TX, by a refinery half-owned by Saudi Aramco, as some suggest, where does the oil come from after all? 10.) Building the KXL is inevitable - This argument has been made by proponents for years -- and even a few environmentalists. The latter suggest trying to stop KXL diverts attention from coming up with the full suite of solutions we'll need to wean ourselves from fossil fuels over the long haul, invest in alternative energy, and address climate change. I remain skeptical about the claims on both sides of the Keystone Pipeline, but I hope that the Obama administration will take a look at all the data and come to a reasonable decision about what to do, rather than give in to the side with the largest wallet or most strident voice. The Monsters Came to Poydras Street: Super Bowl Blackout Failure or Future? In "The Monsters Are Due on Maple Street," a 1960 Twilight Zone episode starring Claude Akin and Jack Weston, the residents of a typical suburban neighborhood lose their cool after a power failure is linked to a science fiction story about aliens posing as humans prior to a full-scale invasion. United Planets Cruiser C-57D or Superdome? The residents of the neighborhood are shown all chummy and cooperative and, well, neighborly, until something in the sky causes the lights to go out. Cars won't start and even the portable radios are silent. Someone first blames it on a meteor, but then one young boy offers an alternative suggestion. He recalls a science fiction story about a family of aliens sent to infiltrate a neighborhood much like theirs to prepare the way for a take over. The family looks just like a "typical human family: father, mother, and two kids," says the boy. Suspicion rules and paranoia escalates as neighbor turns on neighbor. A witch hunt ensues as first one and then another is accused of being the alien and on very little evidence. Someone gets killed, there's a riot, and mass hysteria breaks out. (I won't tell you how it ends; you should watch it on Netflix.) Suffice it to say, Maple Street is never the same. Watching the episode last night, I couldn't help drawing parallels with the blackout during Sunday night's Super Bowl. 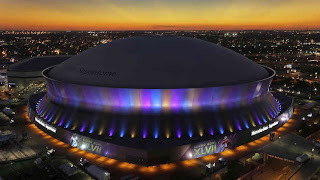 The initially confused and perplexed faces of the players as they looked up to the ceiling of the Superdome in New Orleans as the lights started to go out giving way to anger expressed by the coaches as officials tried to explain the situation. 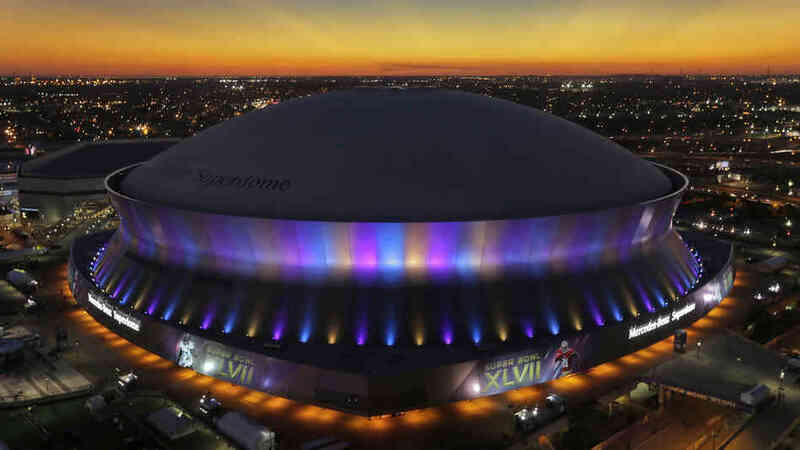 Superdome or Alien Space Ship? And then the blame game as Entergy tried to excuse itself, Peabody pinned it on reduced coal use, and stadium officials couldn't really shed any light on the situation. I wondered what might happen if these types of events become a regular thing -- or when big weather events like Superstorm Sandy increasingly wreak havoc on our communities? As our electricity grid gets increasingly fragile and we grow more dependent upon our electronic devices, will we be able to keep our cool unlike the residents of Maple Street? Unless we make the necessary investments in our energy infrastructure to ensure that these types of events don't occur, we risk finding out the answer to that question. And we may not like the answer.